Horses naturally push into steady pressure, moving against it or barging through it. It’s part of their programming for survival. 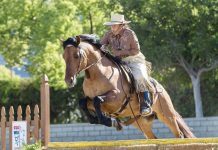 In order to develop a partnership with your horse, you need to help him overcome his fearful, defensive reactions to pressure and learn how to yield and move away from it. I teach this through the Porcupine Game, Game #2 of the Seven Games. Your look conveys your intention. It orchestrates the right body language and the amount of life you need in your body. In the Friendly Game, your look is very soft. If you don’t differentiate your look from a “Friendly” look to a “Porcupine” look, you will confuse your horse and be giving him conflicting aids. You need to be clear. The Porcupine Game uses steady pressure. There are four phases to applying pressure. Each phase becomes progressively and smoothly more insistent, pushing a little harder and making it increasingly uncomfortable for the horse if he doesn’t move. The instant the horse responds by moving away, or even tries to respond, immediately release all the pressure! It’s not the pressure that teaches. It’s the release from pressure that tells the horse he did the right thing. Every time you prepare to play the Porcupine Game, you need to rub him first. After you’ve pressed and he responds, you need to rub that spot again. If you just go to prodding and pressing and never rub before or after, your horse is going to become pretty defensive. Rubbing is a form of the Friendly Game and is important in the horse-human relationship. Instead of starting with your fingertips, you can accelerate the Porcupine Game by using a Carrot Stick. 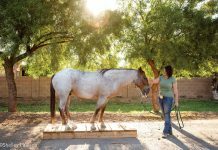 Four feet long, stiff and sturdy, the Carrot Stick enables you to apply pressure to your horse’s chest, neck and hip while staying out of the range of trouble. Because it is always steady and strong, it is far more effective than your fingertips. Since I started teaching the Porcupine Game with a Carrot Stick, the results are much quicker. Use the Carrot Stick to teach, then your fingertips to refine.